The film industry is now shaking with the hot topic 'casting couch' is . Producers, directors and heroes do not leave any one. Rajasekhar has come up with the latest in this affair. A committee has already announced that the casting couch will be dealt with. A recent discussion on this committee was held on a Telugu news channel. In this discussion, actresses Madhavilatha and Gayatri participated. On this occasion she has been accused of extortion. 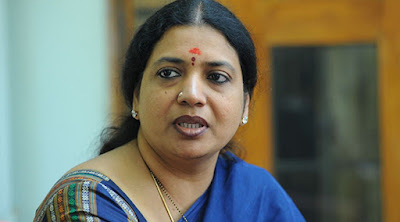 The girls in the hostel in Hyderabad were used by her husband Rajasekhar. But Rajasekhar reacted to it. On Tuesday, a statement was issued to the media. "The TRP Ratings program has conducted a debate on the 14th of this month, which is credited with a lack of cooling for anyone to grow. You all know that a woman who forgot to be a woman in the debate has to say, without any kind of testimony, personal and dignity on my family and me. When she talked about these things, all the questions were not answered. The news was behaved in a way to convince people that she was true. This is my answer to both. ' Be ready for civil and criminal activities that I will take on you for making such false allegations. I want people to trust such baseless news. This is the drama that I am going to be a member of the committee that is going to cast in the film industry. To destroy and publish on publicity I do not want to answer my questions or sit out in the TV channels on a daily basis by making untold propaganda. As a woman I did not do anything wrong with play. Their allegations are baseless. I want people to boycott such broadcasts that are broadcasting such false propaganda. "